Branding - Why are promotional USBs so good for Branding? - iusb - Promotional USBs like no other. - iusb - Promotional USBs like no other. Branding is often one of the last or even forgotten parts of a business’s marketing or advertising spend. Large amounts of money can be spent on SEO and PPC advertising but if you don’t have the right website, look and offer this is often money put down the drain. You want to engage with your customers and often their perception of your business is the difference between winning and losing a sale. This is where Branding really comes into its own. Your Brand is what you promise to your customer, your Branding is how you display and communicate this to them. This why it’s crucial to by maintain and strengthen your brand. Through branding you hope to create an emotional connection or affinity to your company, to provide a justification for why the customer may need to pay a premium for a product or service that you offer, all the while creating loyalty and demonstrating the benefits of the services and/or products of the company behind it. Thankfully these are all things that promotional USBs can help with. 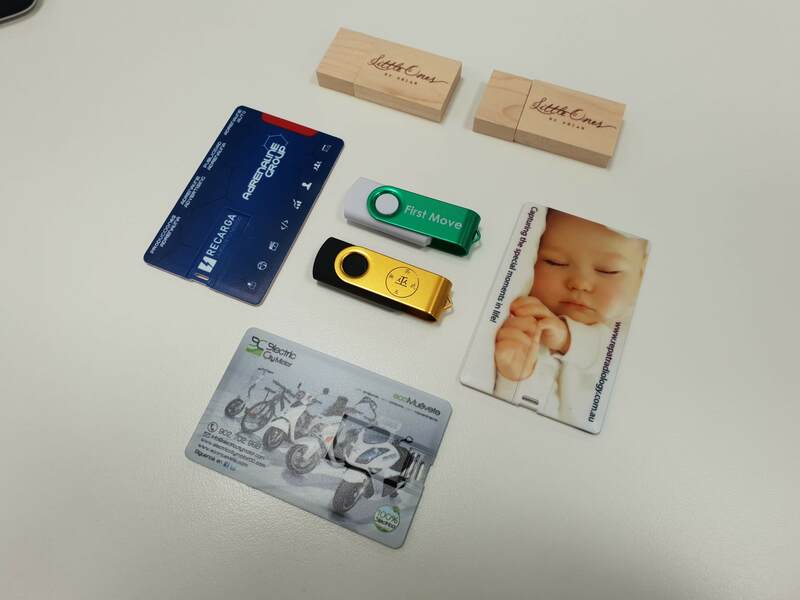 Promotional USBs come in all shapes, sizes, colours and even materials, and this is where their strength lies when it comes to helping companies with their branding. No matter what service or product you sell there is a Promotional USB that can reflect the purpose of your business. If you’re an environmentally conscious business, there is a recycled wood USB that would fit with your corporate profile perfectly. You might be a tech business – maybe a sleek brushed aluminium promotional USB might be a better reflection of you what business ideals. You may be a dental practice, maybe a custom USB designed a set of teeth or dentures will fit the bill and be a bit playful at the same time. When it comes to USBs and branding, the options are endless allowing them to create a reflection and hopefully an affinity to your company. Promotional USBs are regarded as a tech product and tech, in peoples minds, is at the edge of what is possible in this world. This is another advantage when it comes to branding for your company. If you aren’t on the cutting edge or seen to be up with the times through your branding, customers might not see you as market leaders and therefore will seek out your competition who give the perception of being market leaders. If you are seen as market leaders people will understand why they need to pay a premium for your services, as people expect to pay a bit more for the best. A printed USB’s usefulness will also help with creating brand loyalty. Unlike many promotional items, USB drives can be used over and over again for a task that they may not have been originally disturbed for. The USBs may have been given away with no info on them, but now they might be used to store beloved family photos or movies – this means that they won’t be disposed of like other promotional items, and with your logo on them your business name and identity will be at the forefront of the customers mind each time they use it. A promotional USB’s ability to share data quickly and easily also means that it can help demonstrate the benefits of services and products of your company. Business cards go in bin, flyers are never read, but no one throws out a USB stick. But putting all that info either on the artwork of the USB or as docs or images inside the USB means that you can get the information that you want to your clients and prospective clients in a way that they feel like they are getting something great for free because who doesn’t love a promotional USB drive.